Routine automotive wheel care is vital to the overall safety and performance of your vehicle. After all, they are the first and only point of contact with the ground beneath you. For this reason, you must regularly inspect your tires, rims, and brakes to ensure that your vehicle is still safe to operate. One of the most common mistakes made by drivers is over-inflating their tires. Over-inflated tires are not only detrimental to your vehicle’s operation, but also to your overall safety. Continue reading to learn what you need to know about tire over-inflation, including how to check your tire pressure, recommended tire services, and answers to common tire care questions. Proper tire pressure is important because it maintains proper sidewall flexion and reduces stress on all tire components, which ultimately promotes better fuel economy, traction, handling, braking, temperature control, tread wear, and much more. In fact, tire pressure influences various components and systems in a vehicle, and thus, effects all aspects of driving safety and performance. 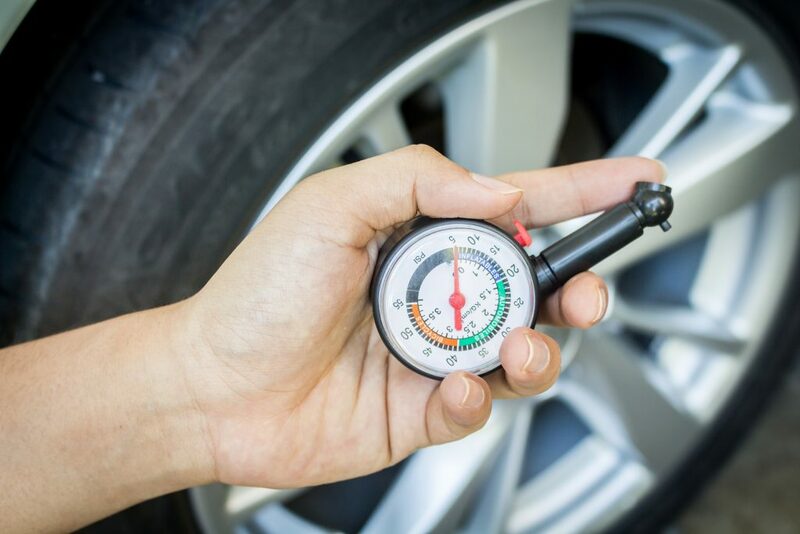 Most modern vehicles are equipped with tire pressure monitoring systems, which are designed with advanced technology to detect and warn drivers of under and over-inflated tires. In vehicles equipped with TPMS, a light will illuminate on the dashboard to indicate unsafe tire pressure detection. This light will remain on until the air pressure imbalance is resolved. These systems are always operating in a vehicle, which means they continually measure tire pressure to ensure that all tires are properly inflated. Those without a modern tire pressure monitoring system in their vehicle are left to use manual tire gauges to measure tire pressure. You can choose between a digital gauge or a “pop-out” style gauge. If you have a roadside kit in your car, it likely has a tire pressure gauge inside. If you do not have one already, tire pressure gauges are cheap and available almost anywhere with an automotive section, even gas stations. In order to use a tire pressure gauge properly, be sure to begin on a “cold” car that has not been driven in the past few hours. Then just refer to the manufacturer instructions for a step-by-step guide on how to use your tire pressure gauge. Under-inflation is just as bad for tires, so be on the lookout for improper tire pressure figures across the board. Since tires naturally lose 1 to 2 PSI (pounds per square inch) per month, the Car Care Council suggests checking your vehicle’s tire pressure monthly, especially during the winter season when cold temperatures cause increased air loss in tires, in order to keep your TPMS light from coming on. You might be interested to learn that, according to the U.S. Tire Manufacturers Association, every 10 degree decrease in temperature causes tire pressure to decrease by one to two pounds per square inch (PSI). Furthermore, it is also vital to service your vehicle’s tires regularly. This include tire rotations, balancing, brake pad replacement, brake inspections, and more. This should be done every 3 to 5,000 miles or so, depending on the make and model of your vehicle and how much you drive. Talk to an ASE licensed car mechanic for professional advice regarding your car’s factory scheduled maintenance plan. Call Northeast Auto Service at 317-475-1846 when your automotive lights come on. We are ASE licensed and certified Indianapolis automotive shop that provides a wide range of foreign and domestic auto repair services, as well as, free estimates, automotive service coupons, and more. We offer quality service at the most affordable prices in town. Request a free estimate, today and see for yourself! This entry was posted in Car Care Tips and tagged auto service Indianapolis, Checking Tire Pressure, how to check tire pressure, tire pressure facts, tire pressure monitoring systems, tire pressure tips, Tire Pressure TPMS. Bookmark the permalink.